We offer both Before and After School Programs for Glen Rock Public School students. This program is operated at all elementary schools by the Glen Rock Community School. The programs are nonacademic, but provide time for study and play. The Before School Program is available from 7:00 - 8:25 am each day that school is in session. At 8:25 am children walk to their class line. Children can play quiet games, indoor sports, or participate in other school activities, if scheduled. Breakfast is not provided, however children can bring something from home. The After School Program begins at dismissal (3:18 pm on full school days) and finishes at 6:30 pm. On scheduled early dismissal days, care is provided from 12:33 pm until 6:30 pm and children bring lunch from home. During the After School Program, children participate in a variety of activities including outdoor play time, games and arts and crafts. Homework time is scheduled and students are encouraged to use this time for that purpose or some other quiet activity. Staff members are committed to providing a safe, secure, caring environment for children outside of school hours. Each site is managed by a lead caregiver who is assisted by another adult. High school student aides are added as needed. The program is supervised by the coordinator, who reports to the community school manager. Before and After School Program fees are assessed monthly. Students must be enrolled for a minimum of two days. A $75 non-refundable registration fee is payable annually at registration. Ten payments are required per year, one each month—September through June. Fees are based on the school year, not the number of days in each month. Monthly payments are not reduced because of a child’s illness or other absence. Tuition payments are due on the first of each month. The Community Pass website will issue an email reminder on the 26th of the prior month to assist families in making timely payments. Please note that this is done as a courtesy only, and non-receipt of the reminder does not negate a family’s responsibility to meet payment deadlines. Online payments can be made using VISA or Master Card. For the security of our families, Community Pass does not retain credit card information. It must be re-entered each month to process payment. We also accept checks or cash at the Glen Rock Community School office, 600 Harristown Road. Be sure to indicate the child’s name in the memo portion of the check. Program fees are due at the community school office by the first of each month. Caregivers cannot accept payment. A $25 late fee will be assessed on any payment received after the 5th of the month. The Community Pass site will automatically assess the late fee when processing a late payment. If payments are routinely received after the 5th of each month, children may be asked to leave the program. For those who pay by check or cash, if the 5th of any month falls on a weekend, holiday, or school break, payment must be received (not postmarked) by the last business day prior to the 5th. 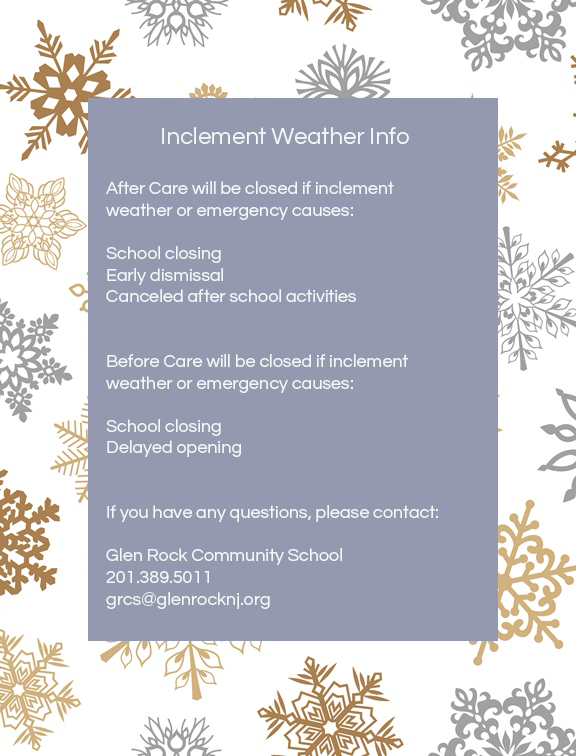 Requests for schedule changes or withdrawal must be submitted in writing no later than the 25th of the preceding month or the Friday prior if the 25th falls on a weekend or holiday.Email notification is required to grcs@glenrocknj.org. Changes will go into effect on or after the first of the following month and cannot be granted on a temporary basis. There is a $20 fee for implementing any change to an existing schedule. The fee must be paid in advance in order to expedite the schedule change. There is no fee to withdraw. Please note: schedule changes or withdrawals can only be made by the community school office staff. Registration is ongoing beginning July 16 and can be made online. To receive services starting on the first day of school (9/5/18) your child’s registration must be completed online at register.communitypass.net/glenrock by Aug. 31, 2018. This includes payment of the registration fee and first month’s tuition and receipt in the community school office of the signed parent agreement. After Aug. 31 registrations will be taken for a Sept. 17 start. Late registration can only be made in person or by calling the office at 201-389-5011. New registrations for October and beyond will be accommodated on a “week prior” basis: the child may begin in the program three business days after all registration forms are completed and returned to the office. Start dates before the 15th of the month will be charged full tuition; on or after the 15th, tuition is half for the first month. We do not provide breakfast. Children may bring breakfast from home. We are a nut free program. Time is set aside each afternoon for snack, which is provided from home via the child’s backpack. Children are not permitted to share snacks. We strongly encourage high-protein, low-sugar items to help sustain your child from lunch until dinner. No candy or nuts are permitted. Note that we do not have refrigeration. Children have access to water fountains and bottle filling stations at all times. We are a nut free program. At pick up you are required to sign out your child each day. It is our strict policy not to release any child until that child has been signed out by a parent or the parent’s designee. If your child is ill on a day when he/she is scheduled to be in the After School Program, or will not be participating for any other reason, please email the program. There are no refunds for absences. With written permission from parents, children may attend on-site clubs or other after-school activities. The leader must receive the child’s schedule prior to the day of the activity. Children may only return to After Care from their on-site club or after school activities held at their school. · If the child leaves directly from class dismissal, the child will be marked absent from After Care and may not attend that day. · If the child leaves for the activity from After Care, an adult with photo ID must sign out the child and must be listed on the event schedule from the parent. The child may not return to After Care following the activity. Please be punctual when picking up your child. If you realize you will be late please send your emergency contact. If you do not arrive by 6:30 pm, staff will try to contact you, then call your emergency contact. If your child is picked up after 6:30 pm, we will assess you a late fee of $2 per minute according to the school clock. If tardiness is ongoing, we may ask you to withdraw your child from the program. If someone other than you or your emergency contact is picking up your child, we must have prior notice and the individual must provide photo identification. If anyone is not permitted to pick up your child, we must receive that in writing. If a court order exists affecting your child’s arrangements, we must have a copy on file in order to comply. Before and After School programs are held each day school is in session, including scheduled half days. In case of a delayed opening the Before School Program is cancelled. To ensure timely receipt of messages regarding school closings or delays, parents should register for the district’s emergency message system. Visit www.glenrocknj.org for registration information. The GRCS will post weather or other emergency closings on our Facebook page and via Twitter. Whenever possible, the GRCS will also send an email message via Community Pass. Parents are asked to keep their email current and provide both home and work email addresses. If your child’s school has an unscheduled early dismissal (i.e., inclement weather, equipment malfunction, etc. ), which results in closure of the school building, the After School Program will be cancelled. In this case, you would be contacted by your child’s home school or the district regarding pick-up. If the After School Program has an emergency closing while it is in in session, you or your emergency contact will receive pick-up instructions from the program. Emergency contacts are required for registration. It is of utmost importance that your emergency contacts are located nearby in order to reach the school quickly in an emergency. They must be someone other than a parent and kept up to date. The emergency contact must provide proof of identification when picking up. If your child has a serious accident, the Glen Rock Police Department and Volunteer Ambulance Corps will be contacted first, then the parent, then the emergency contact if necessary. If your child appears ill, we will call the parent/guardian first then the emergency contact. Staff members are not permitted to administer medication under any circumstances, with the exception of an EpiPen. The community school office and your child’s primary caregiver must be advised if your child carries an EpiPen. A current EpiPen must be provided to the program. Even if your child has an EpiPen on file with the school nurse, we must have duplicate materials since we do not have access to the nurse’s office during our hours of operation. Due to confidentiality rules, we must receive written permission from parents in order to receive information from Special Education Services for applicable children. While those same services are not available in the Before and After Care Program, it is important that the program leadership is aware of any special needs children may have in order to provide them with the best possible experience in our program. Please call the community school office and ask to speak directly with the manager. · If no appreciable change occurs in the child’s behavior within two weeks, schedule a conference to include the coordinator, the parent and the caregiver, and the community school manager if necessary. · If no appreciable change occurs within a month, the child may be asked to withdraw from the program. We will try every reasonable means to help the child adjust to the program’s schedule, staff, and other children. We must, however, consider the good of all participants when making program decisions. Please use email to report an absence. Telephone extensions are operational only during program hours and may not be answered immediately when the staff is attending to the children.